Buffalo, NY (US) – Orin Langelle, a Buffalo-based photojournalist, in conjunction with the Asia Pacific Research Network , has a new photo exhibit documenting two decades of protests against globalizationhttp://wp.me/p2Mr2B-JC that is being shown during the WTO ministerial in Bali, Indonesia. The meeting started yesterday and ends on 6 December. The exhibit is titled Peoples’ Struggle Against the WTO and Neoliberal Globalization. The exhibit marks the 10th anniversary of the death of South Korean farmer Lee Kyung Hae, who took his life in 2003 while atop the barricades surrounding the WTO Ministerial in Cancún, Mexico. He wore a sign around his neck that said WTO Kills Farmers. 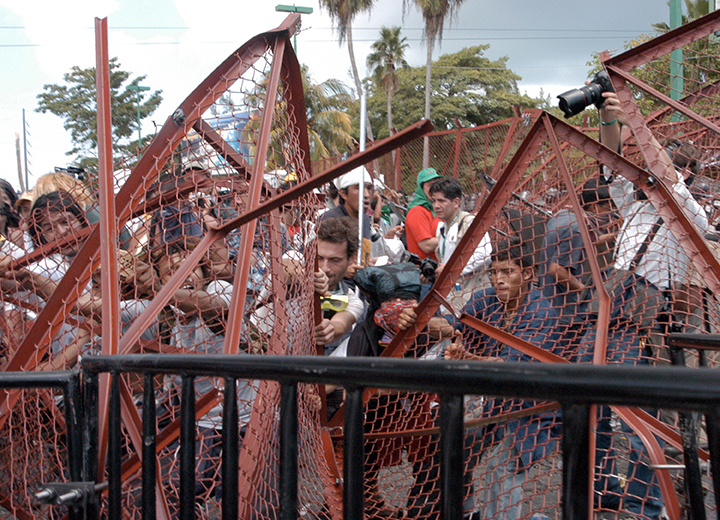 His action was part of massive protests in Cancún against the trade policies of the WTO. Moments before he died, Lee Kyung Hae said, “Don’t worry about me, just struggle your hardest.” He was a member of La Via Campesina , the International Peasant’s Movement.